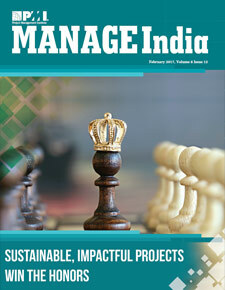 I am thankful to have the privilege to publish first Newsletter of PMI North India Chapter. First and foremost, I would like to thanks fellow members, who took out time from busy schedule to enlighten us with the articles for the very first edition. Our effort “The First Newsletter of PMI North India Chapter” echoes the same feeling and passion. Our newsletter “Synergy - Collaborating Project Management for High Performance Businesses” has also been possible only because of support from members of PMI North India Chapter. We believe that this Synergy will add another milestone in PMI – North India Chapter’s continuous growth. How to make a Client-Vendor Engagement a win-win for both? "Good project managers admit mistakes: that's why you so rarely meet a good project manager!" 1. While selecting project Manager for your organization, do you also check his/her domain knowledge (industry) as a mandatory requirement along with his/her Project management knowledge? 2. Which of the following is not an Agile principle and practice?